On the 18th September 2015, "Hunting High And Low" was remastered and re-issued by Rhino Records. As well as a regular 10-track jewel case release, there was also a special limited edition 30th Anniversary book edition. The UK jewel case edition comes with a red sticker on the front of the CD case displaying the text "Includes Take On Me, The Sun Always Shines On T.V. and Hunting High And Low" which is printed in black and white text. The original album artwork including the black and white photo of the band taken in a cafe (by Just Loomis) with a grey a-ha-logo and red title is included in the top left corner. The reverse of the CD also comes with a similar back sleeve to the original release, displaying the full track listing in grey down the left-hand side, and the black and white picture of the three band members located down the right-hand side. The regular production credits to Tony Mansfield and Alan Tarney is shown, along with the album remixing by John Ratcliff with a-ha, but the original recording text; "the music on this compact digital disc was originally recorded on analog equipment. we have attempted to preserve, as closely as possible the resolution, however, the compact disc can reveal limitations of the source tape." Has now been omitted. At the bottom left of the back sleeve, it contains the usual "WB RECORDS" logo and an additional "RHINO" one. Some revised details of the US record company address is included along with the regular manufacturing and copyright information; "© 1985 Warner Bros. Records Inc. ℗ 1985 Warner Bros. Records Inc. for the U.S. and WEA International Inc. for the world outside of the U.S. All Rights Reserved. Marketed by Rhino Entertainment Company, a Warner Music Group Company, 3400 W. Olive Ave., Burbank, CA 91505 – 4614. Unauthorized copying, hiring, lending, public performance, and broadcasting of this recording prohibited. Manufactured in E.U. LC02982". The inside of the album includes the regular black and white fold-out insert displaying the full track listing and some of the original production credits on the two centre pages, On the left-hand side under the track listing, there has been some additional publishing contact address details been added; "all songs by paul waaktaar-savoy except as indicated. copyright 1984 sony/atv music publishing uk limited. all rights administered by sony/atv music publishing llc, 8 music square west, nashville, tn 37203. All rights reserved. used by permission". Whilst on the right-hand side of the fold-out insert, containing the original mastering information; "lp originally mastered by bobby hata at k disc mastering, Hollywood cdd pre-mastering by wci record group" and a-ha fan club address at "the post office high street headley, bordon, hants gu 35 8bq england". The information has been replaced instead by "managed by herald wilk for scoundrel days as", the "a-ha.com" website and "remastering: dan Hersch, dave Schultz & bill inglot at digiprep". On the reverse of the insert it displays a revised Catalogue number 081227951313, regular black and white pictures of the three band members, "WB RECORDS" and "RHINO" logos, plus "© 1985 Warner Bros. Records Inc. Printed in E.U." Additionally, on the inside of the back sleeve is a pencil-drawn image taken from the take on me video. Some additional standard red "hunting high and low 2015 remaster" text has also been printed to the left of the inner back sleeve which can be seen through the front of the spine. The disc itself is silver with black text, coming with a similar layout to the original release, although the title "HUNTING HIGH AND LOW" along the top has now been printed in bright red (rather than the regular black). The centre of the disc contains a large silver centre ring rather than a clear plastic one. The full track listing including track numbers and track lengths is listed as usual down the right-hand side. On the left-hand side, the production information is slightly different and now includes some additional copyright text; "℗ 1985 Warner Bros. Records Inc. for the U.S. and WEA International Inc. for the world outside of the U.S. All Rights Reserved. Marketed by Rhino Entertainment Company, a Warner Music Group Company. Unauthorized copying, hiring, lending, public performance, and broadcasting of this recording prohibited. LC02982". Below the centre ring of the disc is the regular; "PRODUCED BY TONY MANSFIELD *PRODUCED BY ALAN TARNEY **PRODUCED BY JOHN RATCLIFF WITH A-HA" text in bold, plus the "WB RECORDS" and "RHINO" logos, Catalogue number 081227951313 and that the CD was "MADE IN E.U." The cover of the hardback book features the same artwork as the original release of the album, with the full tracklisting of all 4 discs on the back. A red rectangular sticker on the front of the cellophane states in white font: "a-ha hunting high and low 30th Anniversary - Limited Edition 4CD/DVD DELUXE BOX SET loaded With Rare And Unreleased Demos, Mixes and Music Videos!" with the catalogue number in smaller font below. 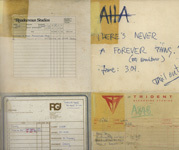 Inside the front and back covers of the book are song notes from the band's time at Rendezvous Studios, written on the studio's headed paper and other notes on R G Jones Studios and Trident Recording Studios headed paper. The 31 page double sided booklet is packed with photos from the band's early career, extracts for their notebooks, some of the story of the early years and song lyrics. At the back of the book are 4 thick cardboard pages which house the four CDs and DVD and feature drawing from the "Take On Me" video plus track information. All tracks have been remastered for this release and it includes some previously unreleased tracks*. Th first disc is a 2015 remaster of the original album release. The second disc features 25 early demos, some of unreleased tracks, the first five were recorded in Nærsnes, Norway and the next twenty at Rendezvuos Studios. Disc 3 features 15 tracks of singles, extended version and B-sides. The fourth CD features 10 alternative mixes, previously unissued. The DVD features videos of the four singles from the album plus two additional versions of "Take On Me", the 1984 version and an alternative cut of the 1985 version. Test pressings for this album come in separare slimline digi paks. The sleeves are white with the following text in black (one for each of the 4 discs): "RHINO ENTERTAINMENT a-ha HUNTING HIGH AND LOW ULTRA-DELUXE CD COPY DISC 1 3/27/2015 REF DISC ONLY, NOT FOR MFG". In the bottom right hand corner of the front sleeve is a large black lower case "d" with a red superscript "2". The tracks and titles are listed on the inside of the digi-pak. The discs are white with "RHINO ENTERTAINMENT" in black at the top and the rest of the text, as printed on the front sleeve, at the bottom. The black "d" with superscript red "2" is printed on the left hand side of the disc. These pressings were limited to 5 copies. The DVD test pressing come in a jewel case without sleeve. The disc is white with the green and yellow "Craigman Digital" logo on the left hand side. 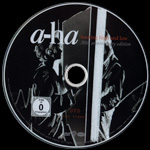 "A-HA HUNTING HIGH AND LOW VIDEOS" is printed in black at the top, the DVD video logo on the right hand side plus "RC 1 5/8/15" at the bottom. US Craigman Digital contact details are printed in black around the outside of the disc. There is a Brazilian remastered 10-track jewel case edition of "hunting high and low" which was manufactured and distributed by "Sonopress under license to Warner Music Brasil Ltda", it is similar to the UK release displaying the regular front and back album cover artworks. The standard red "hunting high and low 2015 remaster" text is on display as usual through the front of the spine. At the bottom right hand corner, there is a red rectangular sticker included but without the curved edges, some of the text on display has been printed instead in Portuguese to read; "- Inclui – Take On Me The Sun Always Shines On T.V. e Hunting High and Low 0081227951313". On the back sleeve, the standard Barcode number "0 81227 95131 3" is included in the top right hand corner. The regular "WB RECORDS" and "RHINO" logos are also present on the lower left hand side under the full track listing, along with the additional "PRODUZIDO NO POLO INDUSTRIAL DE MANAUS CONHECA A AMAZONIA" flying Amazon bird and "COMPACT disc DIGITAL AUDIO" logos. At the very bottom left hand corner, there is some Brazilian manufacturing, production and copyright information; "© 1985 Warner Bros. Records Inc. ℗ 1985 Warner Bros. Records Inc. for the U.S. and WEA International Inc. for the world outside of the U.S. Warner Music Brasil Ltda. – uma empresa Warner Music Group. Produzido no Polo Industrial de Manaus e distribuido por Sonopress Rimo Ind. e Com. Fonog. S/A – Ind. Bras. Av. Guaruba, nº 585 – CEP 69075-080 – Distrito Industrial – Manaus – AM – CNPJ 67.562.884/0004-91. Sob Licenca de Warner Music Brasil Ltda. – CNPJ 42.470.112/0001-56. Todos os direitos reservados. Proibida a reproducao, execucao publica e locacao desautorizadas sob as penas da lei. O prazo de validade do disco CD ou DVD e indeterminado desde que observado os seguintes cuidados: Armazenar em local seco, livre de poeira, nao expor ao sol, nao riscar, nao dobrar, nao engordurar, nao mantar a uma temperatura superior a 55°C e umidade acima de 60g/m3 e segurar o disco sempre pela lateral e pelo furo central. DISCO E CULTURA. Denuncie a pirataria: [email protected] www.warnermusic.com.br". Some of the text also additionally includes how to care for your CD, Store in a dry place, free from dust, do not expose to the sun, do not scratch, bend, do not grease, do not store at a temperature higher than 55°C humidity above 60g/m3 and always hold the disc by the side and the central hole. An Anti-paracy website address is also included. The inside of the album comes with the regular black and white fold-out insert displaying the full track listing and production credits on the two centre pages. 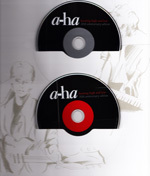 The disc is silver and comes with a similar layout to the UK edition with A-HA in black along the top and title; "HUNTING HIGH AND LOW" displayed in red underneath. The full track listing as usual is listed in black down the right hand side. On the left hand side, there is some production and copyright information which is similar to that printed on the back sleeve; "℗ 1985 Warner Bros. Records Inc. for the U.S. and WEA International Inc. for the world outside of the U.S. Warner Music Brasil Ltda. Produzido no Polo Industrial de Manaus e distribuido por Sonopress Rimo Ind. e Com. Fonog. S/A – Ind. Bras. - CNPJ 67.562.884/0004-91. Sob Licenca de Warner Music Brasil Ltda. – CNPJ 42.470.112/0001-56. Todos os direitos reservados. Proibida a reproducao, execucao publica e locacao desautorizadas sob as penas da lei". The regular Production credits to Tony Mansfield, Alan Tarney and John Ratcliff with A-ha are displayed at the lower half of the disc under the centre ring. At the bottom of the disc, the four logos which appear on the back sleeve; "PRODUZIDO NO POLO INDUSTRIAL DE MANAUS CONHECA A AMAZONIA" flying amazon bird, "COMPACT disc DIGITAL AUDIO", "WB RECORDS" and "RHINO" are included, along with the Catalogue number 0081227951313. At least two copies of this Brazilian remastered CD album are known to exist, but include some different batch issue coding on the back sleeve above the barcode and around the centre ring of the disc; AA0002000 and AB0001000. The 10-track remastered edition of "A-ha hunting high and low" was also available in Russia; it contains the regular front and back cover artworks, but includes a duplicate front cover artwork sheet placed in front of the existing fold-out insert to include the design of the red sticker located in the bottom right hand corner, which has now been actually printed (rather than stuck) onto the actual sleeve, it however does not include the Catalogue number at the end. There is also an additional white rectangular logo printed at the top right hand corner advertising the local Russian Radio Station "On Seven Hills"; "Paduo 7 104.7 на семи холмах" in black and orange text. On the back sleeve, the barcode included in the top right hand corner comes with a different number "0 081227 949839" compared to the one displayed on the UK European made edition. The regular track listing, additional production credits and usual album picture of Morten, Paul and Magne in front of the mirror are present, along with the "WB RECORDS" and "RHINO" logos. An additional "WARNER MUSIC RUSSIA" logo has been included. At the bottom left hand corner, the manufacturing, production and copyright information has been revised and printed mainly in Russian to read; "Выпущено ооо «Ворнер Мьюзик», 2015. Проиэведено в России. Все права эащищены. Нарушения преследуются по эакону. Преднаэначено исключительно для домашнего прослушивания. Испольэование проиэведений беэ получения раэрешения правооблателя эапрещено. Иепольэование фонограмм путём публичного исполнения, передачи в эфир и сообщения для всеобщего сведения по кабелю воэможно только при уеловии выплаты воэнагражления. Сбор воэнаграждения осуществляется органиэацией по управлению правами на коллективной основе. Маркетинг и дистр. в СНГ: ООО «Ворнер Мьюзик». Юр. адрес: Россия. 105066.г. Москва. ул. Старая Басманная. д. 32, стр. 1А; факт. адрес и адрес для налравления предложений и претенэии: Россия, 105120, г. Москва, Наставнический пер. Л. 17, стр. 1. Тел. : +74957875670, факс: +74957875676: e-mail: [email protected] Муэыкалыный компакт-диск формата CD-DA. Техниуеские характеристики IEC 908 Red Book. Обяэателыюй сертификащии не подлежит. Не полвергать. механическому нли магнитному воэдеиетвию. Иэбегать попалания прямых солнечных лучей или влаги. Иэготовитель (см. инф. на внутр. кольце диска): ооо «Сони ДАДС», Лпценэия РОСКОМНАДЭОРа № 77-339 от 19.11.2010 г., 249010. Калужская обя., г. Боровск. ул. Большая, д. 83, стр. 1. www.warnermusic.ru.". The actual disc is silver and comes with the regular black text apart from the title "HUNTING HIGH AND LOW" being in red along the top. On the left hand side, the production and copyright information has been printed and displayed mainly in Russian to read; "℗ 1985 Warner Bros. Records Inc. All Rights Reserved. Выпущено ооо «Ворнер Мьюзик», 2015. Проиэведено в России. Все права эащищены. Нарушения преследуются по эакону. Преднаэначено исключительно для домашнего прослушивания. Испольэование Иепольэование фонограмм путём публичного исполнения, передачи в эфир и сообщения для всеобщего сведения по кабелю воэможно только при уеловии выплаты воэнагражления. 8122794983". The full track listing is listed as usual down the right hand side. At the lower half of the disc under the centre ring is the regular Production credits to Tony Mansfield, Alan Tarney, John Ratcliff and A-ha, along with the additional "WARNER MUSIC RUSSIA", "WB RECORDS" and "RHINO" logos which are all included. On the reverse of the fold-out insert it also displays in Russian; "Проиэведено в России. Все права эащищены" that the album was; "Produced in Russian. All Rights Reserved". The Catalogue number 8122794983 is also shown. The 10–track remastered album of hunting high and low was also manufactured and available in the USA; it comes with the regular front and back cover artworks including the red sticker on the front cover but displays a different Catalogue number RR2 25300 at the end. Along the top of the CD case is an additional blue and white seal with the catalogue number reference IR2 5300, title "a-ha Hunting High And Low" and a non-numbered barcode. On the back sleeve, the layout is virtually the same as the UK edition to include the regular track listing down the left hand side and additional production credits underneath. The barcode at the top right hand corner contains the same number "0 81227 95131 3" as the UK release along with the regular band member photo sitting in front of the mirror at the bottom right. At the lower left of the back sleeve is the usual "WB RECORDS" & "RHINO" logos. There is also some slight amendment to the manufacturing and copyright information to show that the CD was "Made in U.S.A." and to include some additional FBI Anti-Piracy text; "© 1985 Warner Bros. Records Inc. ℗ 1985 Warner Bros. Records Inc. for the U.S. and WEA International Inc. for the world outside of the U.S. All Rights Reserved. Manufactured & Marketed by Rhino Entertainment Company, a Warner Music Group Company, 3400 W. Olive Ave., Burbank, CA 91505 – 4614. Made in U.S.A. FBI Anti-Piracy Warning: Unauthorized copying is a punishable under federal law". There is also a round "FBI ANTI-PIRACY WARNING DEPARTMENT OF JUSTICE FEDERAL BUREAU OF INVESTIGATION" symbol included on the back sleeve. On the spine, the layout is the same as the UK edition but coming instead with the US Catalogue number RR2 25300 on the left. The inside of the album includes the regular black and white fold-out insert displaying the full track listing and production credits on the two centre pages, on the reverse of the insert it displays the US Catalogue number RR2 25300 and that the album was "Printed in U.S.A.". The standard red "hunting high and low 2015 remaster" text is on display as usual through the front of the spine. The disc itself has a similar layout to the UK release and is silver with black and red text, it includes a clear plastic centre ring rather than the larger solid silver one. The A-HA logo is included at the top right hand side with the title "HUNTING HIGH AND LOW" printed in red underneath. The regular track listing is listed down the right hand side, with the production; "℗ 1985 Warner Bros. Records Inc. for the U.S. and WEA International Inc. for the world outside of the U.S. All Rights Reserved. Manufactured & Marketed by Rhino Entertainment Company, a Warner Music Group Company." and FBI Anti-Piracy information; "FBI Anti-Piracy Warner: Unauthorized copying is punishable under federal law." on the left hand side. The regular Produced by Tony Mansfield, Alan Tarney and John Ratcliff with A-ha text below the centre ring is included, along with the "WB RECORDS" and "RHINO" logos. Additionally at the bottom of the disc is the US Catalogue number RR2 25300 and that the album was "MADE IN U.S.A.".